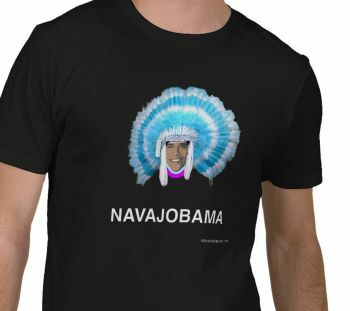 Ok I know this is an attempt to be funny, but I wonder who created this design....I know there are a fair amount of Navajo Obama supporters. Or is this just another take off on yet another version of the photo with Obama in the turban? That's not Obama's face there, looks like someone else altogether. I agree, Dove. These are just some money makers taking advantage of the political race. I can't imagine that Hilary OK'd this one...by the same company. Just another way to make a buck. Totally ridiculous!!! I hope they don't make any money off that!